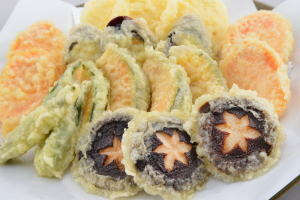 Yasai Tempura ('野菜 天麩羅[テンプラ, てんぷら]', is classified into deep-fried dish), is known as Vegetable Tempura in English, and 蔬菜天妇罗 (Shūcài tiān fù luō) in Chinese. It is the washoku. Egg, Tempura Flour, Oil, Vegetables. Potato Starch, Wheat Flour, Salt, Pepper, Soy Sauce.